Nowadays, Winamp has full support to keyboard shortcuts. But some time ago, when Winamp didn’t have this feature, I was thinking of a way I could change the music just by pressing one button, it would make it faster and easier to change songs, especially during games. So I decided to make an external control to it. 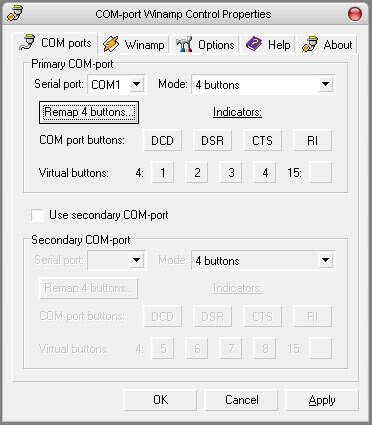 I found one Winamp plugin that shows how to configure an external control using the Serial Port, being able to make 4 or 15 buttons control. I decided to make this, step-by-step, how to do it, hope you enjoy. You can put the buttons wherever you want, I decided to put mine in an old diskbox. I decided to use a network cable to connect the Serial connector to the buttons, because it’s easier to organize and makes the work simpler and faster. 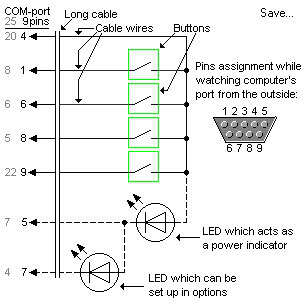 Looking at the schematic, we see that we have to connect one side of each button to a cable, these will be soldered in pin number 4. 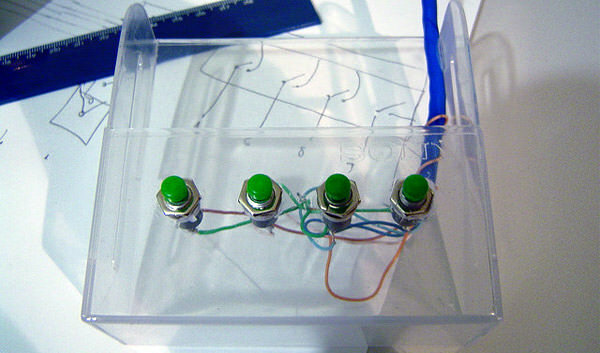 After soldering to one side of each button, you must then connect the other side with a cable that goes to the pins of the serial. 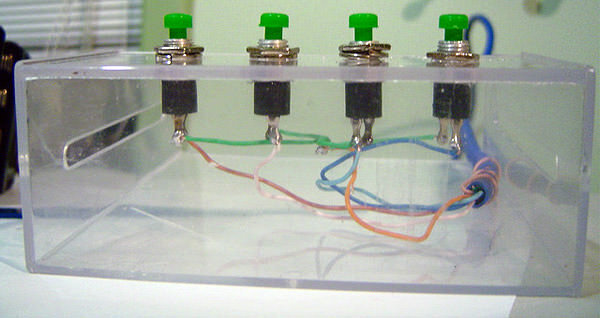 Now it is important that they are connected with the indicated pins (Just follow the schematic) . Here you can see a picture of my work until now. The software I used on this was COM-port Winamp Control V.1.42. You must set the COM port you are using. Usually normal computers have 2 ports, so just select the one you plugged the control in. Now you must remap the buttons. This where you’ll see if everything is working. If you are able to remap all the buttons, congrats, it’s working!! The last step, you have to configure what you want the buttons to do. This can be found in the “WINAMP” of the program. There you can set up many different options, like Volume Up, Volume Down, Next Song, Previous Song. One cool thing is “Type:”, where you can configure the way you want the buttons to respond. Click: Just one click to make it work. Can work with one or double-click. Down/Up: This will activate the option when you press and a different one when you release the button. Turbo: Here you can configure the options for holding the button, usually used for Volume Up and Down. I don’t know if I was clear enough in this HowTo, I will re-check this in some time. Nice blog and tutorial ! I’m just starting it, much to do still and much more to come!! It�s pretty cool (both the tutorial and the blog :P). Great job. I wish my computer had a free com port. Just wanted to add that you can also use irDA and Girder software for a wireless remote. Very good tutorial, thanks for the infor i am going to try. I use IR receiver and Girder. It’s much better to use a remote control! not the best looking controls but they do the job ( i guess ) I still like the idea of using an actual remote better. Plus it saves you a lot of time looks cooler and it really doesn’t cost that much more. I use a AutoHotKey, WinLIRC, and a universal remote to control several apps on my computer, including Winamp. Yeah, remote controls are better. Yes, I belive its better to have a remote control for winamp and other windows stuff. But at the time I did this, I just wanted to change music while playing games. Nice work! Any detail on how you made the acrylic case? I got it from an old diskbox. nice I’m going to try this. Could you do one with the 15-button? Or at least provide the pin assignments for a 15-button? Thank you so much for writing this howto! I’ve been trying to figure out a way to do this for a long time! This is perfect! I was looking for a way to change song and volume on my antique radio/MP3 player project. I wanted to still use the antique knobs to do it, and this will work. Oh, is there a way to do this with dials instead of push buttons? Great keep on going !!!! Thanks everybody for the comments. I’ve some more projects to put on this page, they’ll come with time. Thanks again! This is a blaitant ripoff of my com comtrol instruction page that has been up for over 2 years, nice copy job for yuor own cred. Please, next time be original. You should put an ethernet keystone jack in the back of the plastic case and crimp a connector on the end of the cable, then you can plug it into the back of the plastic case. 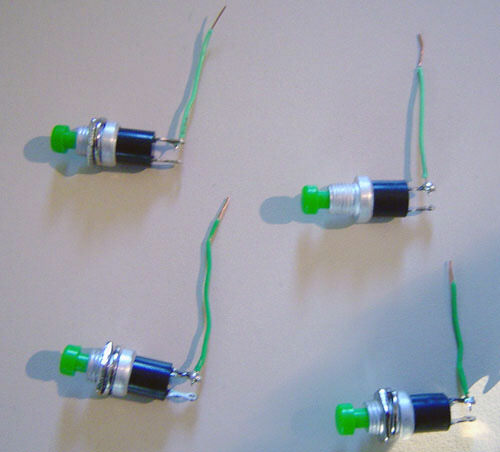 Then you can make yourself a longer cable or put in an extension, whatever, without having to resolder the switches. By the way, nice project you have there! but im not sure to which pin i would connect the 2 added bottons? then for the com program i was thinking to set it up for 15 bottons. Good write up. I’ve actually done this twice (using the same plugin) and it works really well. For my carputer I rigged 3 buttons underneath the change slots in my car and ran them to the trunk. All this to say, it does work, and it works rather well. Thanks man! I built one myself and it works beautifully! I started using winamp just for that! I tried doing this using a USB to Serial adapter because my laptop doesn’t have any serial ports. But it doesn’t work. The program detects the COM port that i assign it. But the buttons don’t get detected when I press them. Lol, just use your symbian phone with a control app, works much much better and safes u a lot of work. #35 – quang – I think that the usb-serial converter won’t work in this application because this application uses a non-standard way of using the serial port. The usb-serial converter emulates only certain functions of the serial port. If you do get it to work somehow please post how you did it, thanks! I’ve got a small LCD display which I use for winamp, news feeds, that kind of thing. What I needed was some buttons for it – thanks! I’m very happy that many people found this tutorial useful!! Thanks everyone for the comments! I don’t understand how to use more than 4 buttons? could someone please help me on that? where do I wire the other buttons to? You can download the winamp plugin, and go to the HELP menu, there is a scheme of how to do with more buttons. Hey i was wondering where you got the push buttons from? I cant find any cool ones like yours. let me know where you got them from, thanks. You can find them in any eletronic store! I actually have a small 200MHz computer that I’ll be putting into my car to play MP3s. This comm-port keypad will allow me to control the volume and play functions remotely. I plan on using and old TV remote arrow buttons for the actual buttons to give it a softer feel. Later. I was gonna add a 2nd LED but I havent done it yet. I might later on. Any questions jus ask. 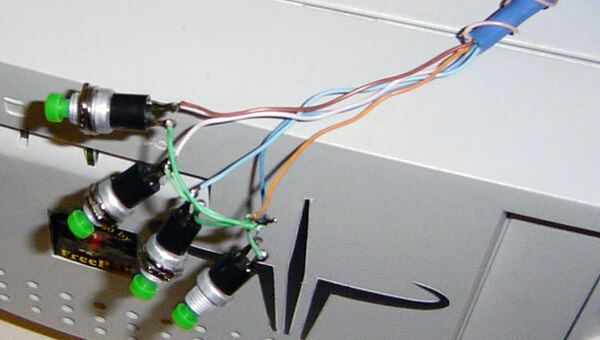 I don’t understand about how to ground it(or where does the ground wire go)or how to connect the LED to everything else.Understand?Please email me at [email protected] or comment after me. Dano, the ground pin the the 4th, you connect one leg of all buttons together in this pin. For example, button one, connects to pin 9 and 4, button two connects to pin 8 and 4, and so on. cool & very nice program . is it possibile to publish the source code ,i think it will be great .it is vb ? hey… on imegabyte’s site, it says that it will work with a usb-serial convertor… any idea how?! except by taking the battery out..
Hello built one this weekend and it works super. Something I wonder is if the program works with a usb converter. And diden’t you use som diods?? Esbj�rn some people tried using the usb converter, but didn’t work. If you manage to make it work, please, let me know! dont u need a resistor for the two leds? if not y, if u do what kind? any chance of adapting it to a six button? Having previously built an 8-LED display for the LPT port, i remember being specifically told that not using resistors on the LED’s would (likley) overdraw the port and fry that part of your motherboard. Having said that LPT is com’s fat ugly cousin, so why wont this fry a com aswell? If I build one of these and it frys my 433’s com bus i am gonna be pissed, unless its spectacular or something – lights the house on fire etc. Great. I am definitely going to make one. hi this is just what i need. im building a laptop into and old CDplayer case for the original front pannel. what would be great is primary and secondary leds have repeat and shuffle triggers. so you know its on shuffle or repeat. I used an old MC-Case and 4 different colored buttons (I already had them in my room and I was too lazy to run to Conrad and buy some new same-colored buttons^^). I left the paper in the box because IMO its looking much better than with a transparent ground. 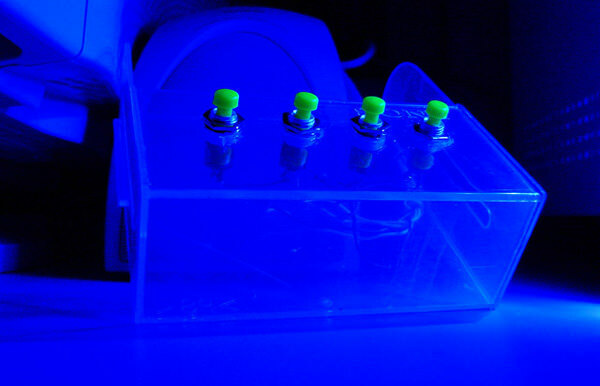 The next thing i will do is using blue/white or one multicolor LED instead of those lame-looking green and yellow LEDs. 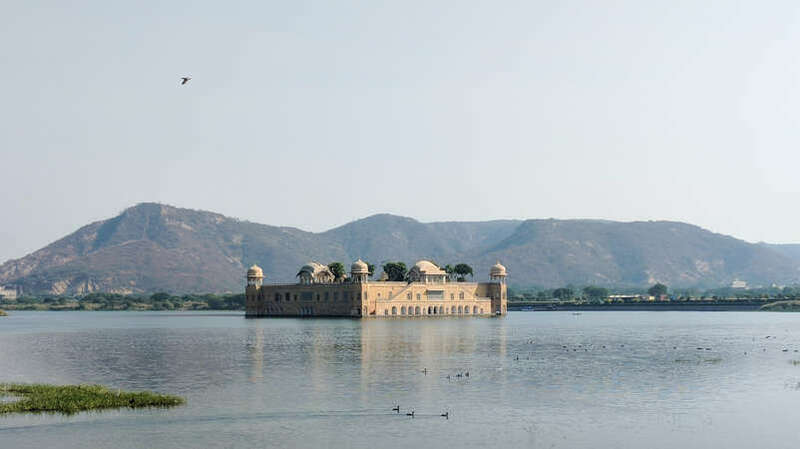 nice article. I was wondering if it is possible to do this but with only 3 buttons ? .. im short on long distance wire :P.
I like the remote because you do have to see wath you are doing, the monitor of my computer is most of the time off. I know everyone here uses Winamp, but I am a Windows Media Player lover and I really like your idea, I’ve been wanting to put some built-in media buttons on my computer case. Is there any way I can use this with Windows Media Player? indybird, sorry man, have no idea! I’m very interested in using your device in a community center I work at. We need to create a way of controling several sessions of WinAmp at the same time. We need to control when each session of winamp plays it’s file. I don’t need to change files, in any of the sessions except the first. We are running 5 sessions of WinAmp on the same PC with XP Pro. Can we have a switch device control each or the sessions, only to trigger the file play in the 4 and to change to the next file in a library for the last session, via say, switches? Say if I’m running 9 sessions of WinAmp at the same time, can I control the playing of their pre-selected files via the switchs, and your program? I don’t get paid at the center, it’s my volunteer work, and I’m trying to help them put together a Halloween Scare House. I’m not sure how to do this using this scheme. But why do you need to use so many Winamp programs at the same time? If you’re trying to put many different sound at the same time, you could use some program like Sound Forge and join all together and using a loop to make the music repeats. Or another thing….. is it posible just to connect 1 button? A much metter way of controlling your music player is using a cheap gamepad: I use a 10 button Logitech gamepad to control XMMS (GNU/Linux/UNIX equivalent of Winamp). Thank you for this tutorial and schematics. I found an old 4 button remote control at a surplus store yesterday and hacked it today for this purpose. It works perfectly for my needs. I did have one difficulty – interpreting what you meant by “pins assignment while watching the port from the outside”. 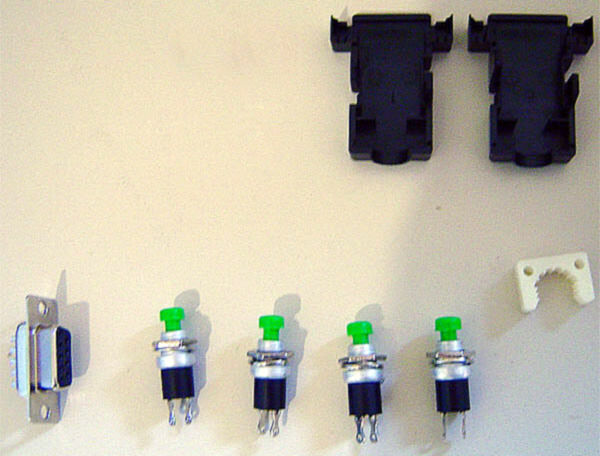 The pin numbers you have marked off are actually a standard – if you look at the front of a db9f connector, the pin numbers are exact to your schematic. 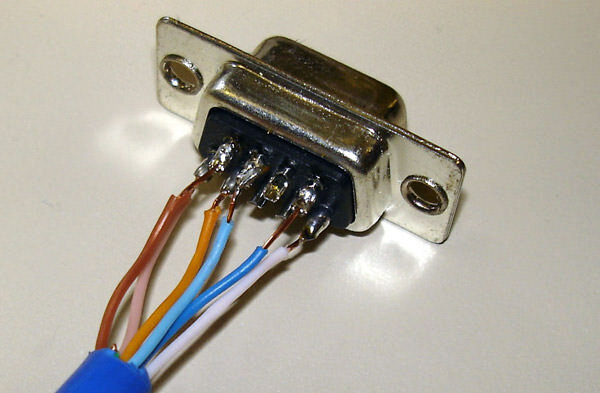 The wording “pins assignment…” made me think that I had to look at the front of a db9m connector, meaning my db9f would be a mirror image. This is not the case. I suggest you simply remove the words as the diagram is perfect. Thanks again, this is VERY cool. do you have design for a single button to comport or even USB…??? I built a quite nice looking remote using the instructions provided, and it works great. After I confirmed that it was working, I took it out of my serial port, and plugged it into my USB->Serial Adapter, and it worked great. No configuration changes required (other than the COM port setting). I do not understand why everyone else was having problems. how do i config second led? thx again!! I need change the buttons (The green buttons) for any electronic circuit because i’m doing a remote control for winamp. I don´t know how make it… if anyone can help me!!!! thank you… and sorry if you can´t understand me!!!! I would like to know if you can use this on USB not on SERIAL? What do you do with pin 2 and 3? Is it possible to use them to add two more buttons? It would be great if there was a way to setup for play/pause, stop, forward, back, volume up and volume down. Alternatively is it possible to set one button something like a ‘shift’ button and have the mapping ‘1’, ‘2’, ‘3’, ‘shift+1’, ‘shift+2’, ‘shift+3’? I made one of these a few years ago in an Altoids tin, and came here looking for a USB solution for my new netbook. No joy there. Gonazar: There is a double tap option so you can program 8 functions, IIRC. I always had a little trouble with it though. I can’t get the software to show me the interface, it is running in the task manager, but can’t see it on task bar!!! alright I changed the port numbers to correct ones from the .ini file and the exe worked!!! Hello Pasteler0, are you still on this project? Hey man, no I’m not. But maybe I can still help!